Today I was back on Moderator duty. 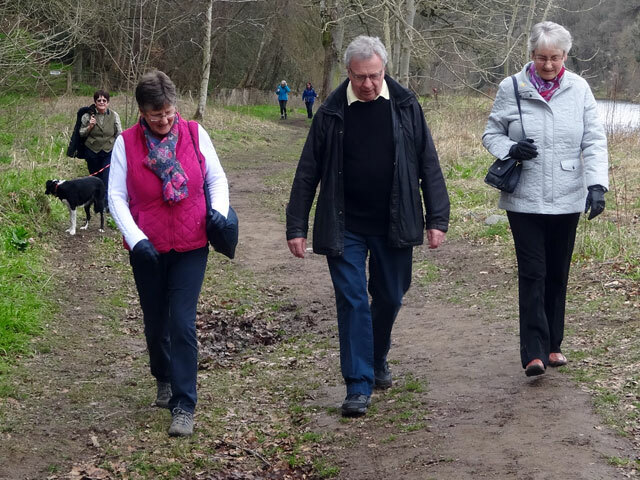 After getting organised, Rachel and I piled the dogs into Rachel’s Bongo and drove off to Abbotsford where we met up with the Moderator and his wife along with folk from Melrose and Peebles Presbytery and from Jedburgh Presbytery. I suppose that there were about a dozen of us in all. We walked along the River Tweed towards Melrose. In fact we didn’t make it because on the way we found a deer which was severely hurt and we took on the task of alerting the SSPCA. In fact we eventually discovered that a staff member of that organisation lived just two hundred and fifty yards from where the incident had occurred and she was able and willing to take over. As a lot of time had now elapsed Rachel and I decided that rather than try to catch up with everyone else we would retrace our steps to Abbotsford. We immediately met up with a very distressed lady who had lost her dog so we spent the next while searching for her dog. It was successful search as we found a lady who had found the dog and were able to share in a tearful reunion and then to find the lady’s husband who was continuing to search unaware of the successful outcome of the hunt. Back at Abbotsford we met up with Victoria and Tim (from Stow) who were returning to collect their car having completed the planned walk. We recounted all of our adventures and came home just in time for our evening meal. Later we relaxed by watching a Montalbano film. It was very good. Then we walked the dogs and retired to bed. It had been an eventful day.